The Delaware Theater Company’s final production of the 2014/2015 Season explores death, loss, abandonment, alcoholism, and incarceration -- themes not typically associated with a children’s show. 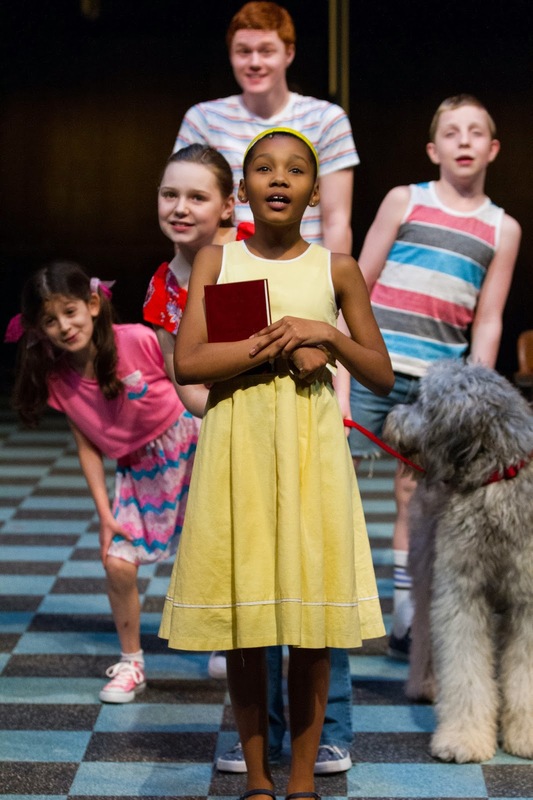 However, Because of Winn-Dixie: A New Musical isn’t a typical children’s show. 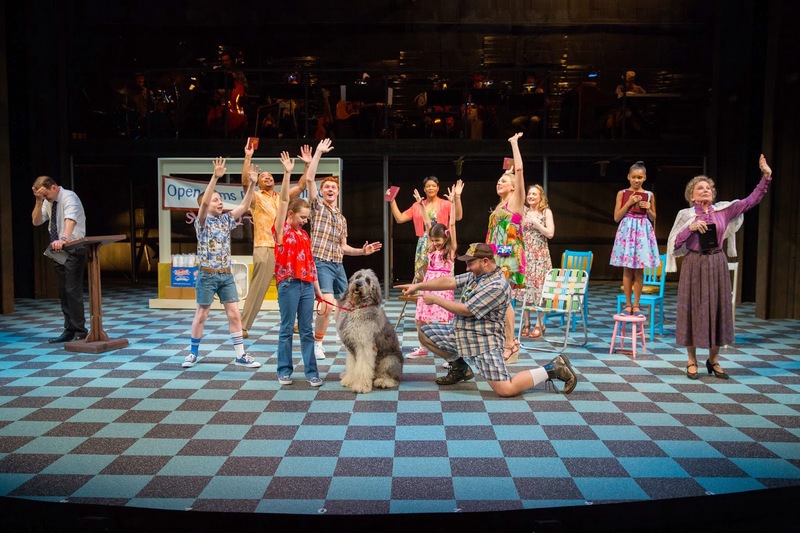 Yes, the production has a group of talented youth in lead roles; yes, it has a cute dog as the star; and yes, it has a logo that features a little girl about to shake a dog’s paw, but the show has depth and is actually about the impact adult situations have on children. The Because of Winn-Dixie cast. artist Duncan Sheik perfectly incorporates singer/songwriter, country, blues, and gospel styles to propel this coming-of-age story. Opal (Kylie McVey) and her father, Preacher (Clarke Thorell), are adjusting to life after the abandonment of Preacher’s wife/Opal’s mother and a recent move to a small southern town, where Preacher will lead a Baptist church. Through Opal’s adventures we meet the quirky townspeople (Miss Franny, The Librarian - Carolyn Mignini; Otis, The Pet Store Man - Christopher Ryan Grant; and Gloria, The Witch - Joilet Harris), the children who Opal befriends (the snooty bookworm Amanda Wilkinson - Leonay Shephard, the young perky Sweetie Pie Thomas - Anya Rothman, and the pesky brother duo Dunlap and Stevie Dewberry - Nicholas Barasch and Evan Dampman), and the children’s parents (single mom of two boys Jeanne Dewberry – Magie Kakis, Amanda’s standoffish parents Carl and Millie Wilkinson – David Jennings and Kimberly Fairbanks, and Sweetie Pie’s good ol’ southern parents Jiggs and Callie Thomas – Brian Michael Hoffman and Jenna Pastuszek), as well as a stray dog (Bowdie) that Opal meets at the local Winn-Dixie grocery store. Opal adopts the dog and appropriately names him after the popular southern grocery chain. On the outside, life seems to be “normal” for the townspeople and their children, but as the show progresses it’s revealed that each family and/or person is dealing with hardship. Not wanting to face their challenges, the parents ignore the situations and don’t discuss the matters with their children, while the other townspeople are willing to share their adverse stories and become friends with the youth. Since the show has a somewhat complex story, director and choreographer Marcia Milgrom Dodge has the difficult task of ensuring Bowdie doesn’t upstage his human co-stars, which could lead to losing the narrative of the show. Thankfully she successfully achieves this task. She manages to give ample time to both Bowdie and his cast mates to shine on the stage, while the story comes to life. Kylie McVey and Bowdie in Because of Winn-Dixie. The lead human in the show shines bright, along with the rest of the cast! For being so young, Miss. McVey has a great voice and strong acting chops. She is wonderful as the brave and curious twelve-year-old Opal who longs to connect with her father and gain a better understanding of her mother’s actions. Equally as good is Mr. Thorell as Preacher. He gives a compelling performance as a man who is trying to cope with his wife’s leaving, raising a daughter on his own, and establishing himself in a new community. Their number “Thirteen Things” is touching as Preacher describes his wife’s good and bad virtues to his pre-teen daughter. Like Miss McVey. Miss Shephard also has a great voice and strong acting chops. With remarkable stage presence, the young actress perfectly captures the feelings of a girl who maintains a tough exterior to shield her inner sadness. The reason for her steel personality is revealed during a duet with Miss McVey (the riveting and haunting number “Not True At All”). While Miss McVey’s character finds solace in her new dog, Miss Shephard’s character finds comfort in her books. Wanting to Read, rather than play with the children of the town keeps her character from establishing relationships with others. The show opens with her reading A Tale of Two Cities and towards the middle of the show she is moving onto Gone with the Wind. Both Ms. Mignini and Mr. Grant give stirring performances in their respected roles. Ms. Mignini, the wealthy librarian with long southern roots captivates during her number “Sweet Life” -- a reminder that the Civil War wasn’t as glamorous as it is portrayed in books and films. Mr. Grant seamlessly handles his multiple duties; he not only performs the part of Otis, the ex-convict owner of the town pet store, he also plays the guitar and at times interacts with the band. The highlight of the show is Ms. Harris’s explosive performance as a town outsider, Gloria. The children believe Gloria a witch, because she mysteriously hangs empty bottles on her tree. The unpleasant reasons for hanging the bottles are revealed during her exuberant show stopping number “Bottle Tree Blues”! She brings great humor and style to this dark, but upbeat song. Berloni, the shaggy dog follows both voice and touch commands (without having to get a treat). Only a person with a cold heart wouldn’t fall in love with the lanky 85 pound standard poodle mix. Bowdie is very fortunate to play on a fantastic set by Allen Moyer. With an elevated tier for the band, set pieces easily enter and exit the grocery store-like checkered floor stage. To invoke the southern charm atmosphere, Mr. Moyer has decorated the proscenium of the stage with pictures of Winn-Dixie stores and other southern images. 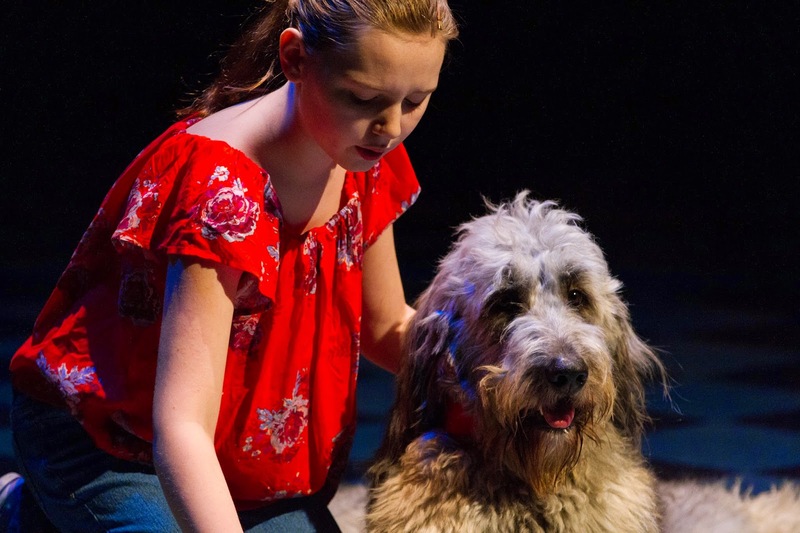 Make sure you see Because of Winn Dixie: A New Musical before it closes and moves to Broadway. The show runs through May 3, at the Delaware Theatre Company. In honor of producing a show that features a dog, DTC will host three community adoption events between 10:00 AM and 2:00 PM on April 18 (Delaware SPCA), April 25 (Faithful Friends) and May 2 (Delaware Humane Association). A ticket to the show is not required to attend the adoption events. Visit www.delawaretheatre.org or call 302.594.1100 for additional information and tickets.